DISCONTINUED.This Logic Combi ESP1 is a gas boiler is a 35kW model; it doesn't require an external water tank or cylinder since everything is combined in one cost effective unit. It’s a condensing wall mounted boiler which has been designed and manufactured by Ideal, so you can be sure you are purchasing a highly reliable boiler. This unit is compatible with a wide range of piping options, optional timers and weather compensation sensors to help give to the ultimate control of your boiler. This unit comes with 2 years warranty as standard and has been endorsed by the Energy Saving Trust. 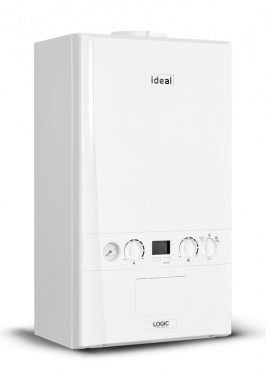 The Ideal Logic Plus is a small in size but big in features no nonsense combination boiler manufactures in Hull by Ideal boilers. They are easy to fit for the tradesman and extremely reliable for the customer. They are covered by a seven year guarantee which gives the customer peace of mind.